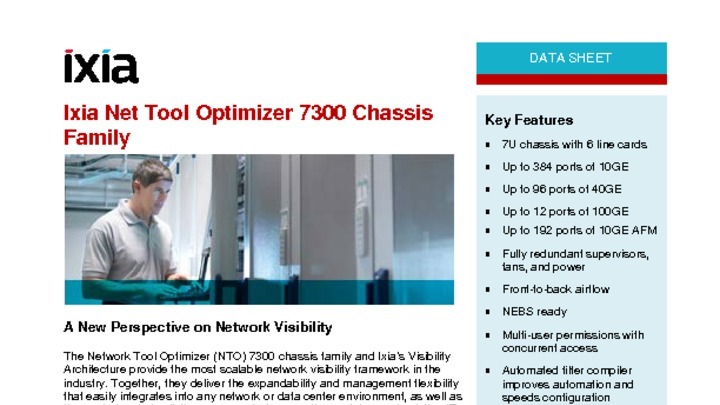 The Network Tool Optimizer (NTO) 7300 delivers a new perspective on network visibility without the need for crash carts or change requests to get the right data to the right tools—right now. This versatile solution and Ixia’s Visibility Architecture provide the most scalable network visibility framework in the industry. Together, they deliver the expandability and management flexibility that easily integrate into any network or data center environment. This visibility solution also offers the control and simplicity necessary to improve the usefulness of existing IT tools. The NTO 7300 (and NEBS 3 Certified 7303) chassis enables centralized control of your network monitoring system in a single, simple, rack-mountable unit. It combines disparate solutions into a smaller data center footprint, saving power and rack space while improving ROI. Designed for large enterprises and service providers, the NTO 7300 meets the provider need for monitoring and network security tools to achieve end-to-end network visibility across both physical and virtual networks. This unprecedented visibility protects tool investments and scales with the network as monitoring needs grow, new applications debut, and security threats emerge. The NTO 7300 fills a critical visibility gap in today’s organizations, helping them leverage existing tool investments and achieve total application and network visibility. This new platform allows network teams to deliver on their service level agreements (SLAs), meet their key performance indicators (KPIs), and provide best-in-class end-user service. High availability with redundant power supplies, fans, and supervisors, or available in single supervisor version.